a genus of plants of the family Cruciferae. They are annuals, biennials, or perennials. The roots are spindle-shaped and branched; the stems, erect or elevated and branching. The leaves are alternate with the lower ones often gathered into a rosette. The leaves and stems may be glabrous or downy. The flowers are gathered in racemes or corymbs, and the petals are most often yellow. The fruit is a pod. The seeds are spheroidal and slightly alveolate, and they vary in color from dark brown to brownish, ruddy, or yellow; their diameter is about 2 mm. The genus Brassica contains more than 100 species, and wild species are found throughout Eurasia. Most species originated in the Mediterranean area or in China. The genus Brassica includes cultivated species used as vegetables and for feed, including various turnips (B. napus rapifera, B. napus, B. rapa subsp. rapifera, B. campestris), rapes, Indian mustard, Abyssinian cabbage, and black mustard, and a number of wild species. Species grown as vegetables and for feed include cabbage (B. olerácea), pakchoi (B. chinensis), and pe-tsai (B. pekinensis). Cabbage is a polymorphic species. According to the classification of P. M. Zhu-kovskii (1964), cabbage includes the following varieties: wild leaf cabbage (B. var. olerácea), or wild cabbage (B. silvestris), branching cabbage (var. ramosa), brussels sprouts (var. gemmifera), feed leaf cabbage (var. viridis), kohlrabi (convar. gongylodes), Portugal cabbage (var. costata), savoy cabbage (var sabauda), true head cabbage (var. capitata), broccoli (var. italica), and cauliflower (var. botrytis). Some researchers divide cabbage into several species. Thus, the Soviet botanist T. V. Lizgunova (1948) distinguishes six independent species: head cabbage (B. capitata), savoy cabbage (B. sabauda), brussels sprouts (B. gemmifera), kohlrabi (B. caulorapa), cauliflower (B. cauliflora), and leaf cabbage (B. subspontanea). These species, which developed as a result of centuries of cultivation (more than 4, 000 years ago), differ greatly in their vegetative organs, but their reproductive organs are very similar. The leafy types were the first to be cultivated. Cauliflower, kohlrabi, pakchoi, and pe-tsai are also ancient forms. The varieties of head cabbage evolved from cultivated leafy cabbages. Resistant to cold, cultivated brassicas are light-loving plants that grow well on highly fertile soils but will not thrive on marshy or acid soils. All species of Brassica are biennial plants except for cauliflower and pe-tsai. Brassicas are grown on all continents and everywhere in the USSR, where head cabbage is one of the chief vegetable crops, accounting for 30 percent of the land under vegetable crops and thereby holding first place. Brassicas also hold first place among vegetable crops in terms of planted area in Great Britain, France, the German Democratic Republic, Norway, and Czechoslovakia. All species of Brassica may be eaten fresh, boiled, or braised, or they may be salted, marinated, dried, or frozen. They contain carbohydrates, proteins, minerals, and vitamins (such as vitamin C and the B group). The brassicas also have dietetic and therapeutic qualities. Head cabbage has the greatest economic importance. The head, which is used for food, is the gigantic terminal bud that grows on a stem 15-20 cm long, which thickens in its central part to form a stump. The leaves are large (25-60 cm), entire, and lyrate. The heads are rounded, flat, or have other shapes. They range from very loose to very dense, have diameters measuring 10-45 cm, and weigh 0.3-16 kg. In the Soviet Union among the most common varieties of white cabbage are those that mature early (Gribovo Number One 147), moderately early (Zolotoi Gektar or Golden Hectare), in midseason (Gribovskaia Slava 231 and Slava 1305), and moderately late and late (Late Byelo-russkaia 455 and Moscow 15, Amager 611, and others). The yield is 20-90 tons per hectare (ha). Red cabbage is grown far less frequently. 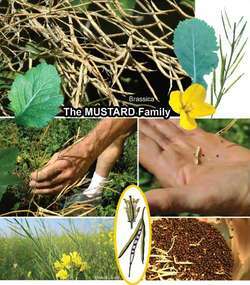 Its head keeps well over the winter and is used in salads, as side dishes, and for marinating. Well-know varieties are Gako, Kamennaia Golovka (Little Stone Head), and Topas. The yield is up to 30 tons. Savoy cabbage is characterized by a higher protein content and good taste when boiled (used as a side dish and for fillings). Its head is relatively loose, being composed of delicate crinkled leaves. Some varieties are Iubileinaia (Jubilee) 2170, Venskaia Ranniaia (Early Vienna grade) 1346, and Vertue 1340. The yield is 17-30 tons per ha. In brussels sprouts little heads the size of walnuts form in the axils along the main stem. They are used in boiled form in soups and as a side dish. The variety Hercules is widespread. The yield is 4-5 tons per ha. Cauliflower is especially valued for its nutritional content, digestibility, and good taste. The part that is eaten is the head, which consists of numerous juicy, delicate shoots with the embryos of racemes. Two subspecies are distinguished—simplex, which includes the most primitive forms, and abortiva, which contains the more cultivated forms with thick white or yellowish heads. The subspecies simplex includes the varieties known as broccoli, or asparagus cabbage; it is widespread in the Mediterranean area and Western Europe but is seldom grown in the USSR. Cauliflower is grown from the extreme south to the extreme north, chiefly in the Mediterranean area, Western Europe, and the United States. In the USSR it is grown near major cities. The most common varieties cultivated in the USSR belong to the subspecies abortiva: Snezhinka (Snowflake), Skorospelka (Fast-maturing), Otechestvennaia (Homeland), Moskovskaia Kon-servnaia (Moscow Canning), and Urozhainaia (Productive). The heads are picked at the point of technical ripening when they reach a diameter of 8-10 cm (300-500 g). The yield on open terrain is up to 18 tons per ha. The edible part of kohlrabi is the turnip-shaped thickening of the stem, which is eaten raw or in fried or braised form. Its taste is like that of the cabbage heart. Leaf cabbage is raised as a vegetable (like spinach), for feed, and sometimes as a decorative plant. Pakchoi is widespread in China and Japan. In the USSR it is planted in the Far East. The leaves are used like spinach or for salads. Pe-tsai is raised as a vegetable (the leaves) and as an oil-producing plant (the seeds). It is common in East Asia and is cultivated to a limited degree in the United States and Western Europe; in the Soviet Union it is grown in the Far North and the Far East. Brassicas are rotated with vegetable, vegetable and fodder, or fodder crops. Good predecessors are beans, cucumbers, onions, tomatoes, beets, and other row crops as well as perennial leguminous grasses. In preparing the soil for brassicas up to 80 tons per ha of organic fertilizer should be applied. The most common method of cultivating brassicas is by transplanting. The seedlings are grown in hothouses, cold or heated frames, and in the open in southern areas. The seedlings can be prepared in feeding pots or without them and with or without intermediate transplanting (thinning out). Care of brassicas consists of interrow tillage, weeding, hilling, fertilizing, watering, and pest and disease control. Owing to the growth of mechanization, brassica cultivation without transplanting—planting seeds directly in open fields— is being practiced on a wide scale. This method has become important in the Far East and in southern regions of the USSR. The winter method is used for growing white cabbage in the Abkhazian ASSR, Azerbaijan SSR, the Black Sea coast of Krasnodar Krai, and the southern shores of the Crimea. Seeds are sown in hothouses in September to obtain seedlings, and the seedlings are planted in open fields in November. The crop is harvested in the middle of May. The techniques of raising brass-icas for seed are approximately the same as those of growing them for food. One brassica seed plant yields 40-50 g of seeds (0.5-0.6 tons per ha). Pests and diseases of brassicas The flea beetle, cabbage maggot, diamondback moth, cabbage butterfly, cabbage cutworm, cabbage aphid, cabbage bug, and blossom beetle are among the pests that do major damage to brassicas. The most common diseases are clubroot of crucifers, wire stem, alternaria blight, downy mildew, gray mold, and storage rot. [Popova, E. M.] “Kapusta.” In Semenovodstvo ovoshchnykn kul’tur: Dlia nechernozemnoi polosy SSSR. Edited by E. I. Ushakova. Moscow, 1953. Biokhimiia ovoshchnykh kul’tur. Edited by A. I. Ermakov and V. V. Arasimovich. Leningrad-Moscow, 1961. Zhukovskii, P. M. Kul’turnye rasteniia iikh sorodichi, 3rd ed. Leningrad, 1971. Lizgunova, T. V. Kapusta. Leningrad, 1965. A large genus of herbs in the family Cruciferae of the order Capparales, including cabbage, watercress, and sweet alyssum. Effect of Solenopsis invicta and its interaction with aphids on the flower-visiting efficiency of Pieris rapae and Apis cerana on Brassica napus. Effect of insecticidal application on aphid population, photosynthetic parameters and yield components of late sown varieties of canola, Brassica napus L.
Evaluation of RFLP and RAPD markers in a comparison of Brassica napus breeding lines. The concentration of Brassica napus pollen reached 72. 2005) obtained similar results in three Brassica species including Brassica oleracea and Brassica napus at NaCl concentration up to 14. While Kaviraj 1 treated diabetes with a combination of Ficus racemosa, Allium cepa, Allium sativum, Zingiber officinale, Capsicum frutescens, and Brassica napus or alternately, only with Abrus precatorius, Kaviraj 2 treated the same disease with a combination of Glycosmis pentaphylla and Sida rhombifolia, and Kaviraj 3 treated diabetes with a combination of Tinospora cordifolia and Curcuma longa. A analise do "pool" de cargas de polen resultou em tres partidas monoflorais de Brassica napus em marco, abril e setembro e duas biflorais' em junho e novembro, alem de cinco heteroflorais. 2008, "Using fluorescent-based AFLP to analyze genetic diversity of yellow-seeded Brassica napus L.
Changes in synthesis and localization of members of the 70-kDa class of heat-shock proteins accompany the induction of embryogenesis in Brassica napus L.
Key words: Brassica napus L, yield components, planting dates, planting densities. Although the product made of the pollen of Brassica napus L.
Trinsoutrot I, Recous S, Mary B, Nieolardot B (2000) C and N fluxes of decomposing 13C and 15N Brassica napus L.